eHarmony is an online dating service headquartered in Santa Monica, California, accounting for 14 percent of the online dating market. It focuses on matching people for love and long-term relationships, rather than hook-ups or casual fun. They aim to look beyond superficial matching for genuine compatibility. The privately held company is still chaired by its founder Neil Clark Warren. eHarmony.com is one of the top visited 3,000 websites on the internet and has millions of daily users. According to internal data over 500 members in the US get married every day. eHarmony was founded in the year 2000 by psychologist and marriage counselor Neil Clark Warren. With his years of experience he theorized that there were 29 Dimensions of Compatibility and by applying these to a dating service he could help millions of people find long lasting love. The company received extensive funding from various sources in the beginning and by 2009 it had made $1.0 billion in cumulative revenue, based on a successful subscription model. In recent years the eHarmony brand has expanded in to relationship advice, and is planning to branch out in to helping people find friends, compatible jobs and to solve other personality and relationship issues. The core eHarmony dating website is located at eHarmony.com and caters to people in the US, Canada, UK, and a wide range of other countries. Common preferences are also categorized, such as Asian, Black, Christian, Senior, Jewish, Hispanic, and Local dating. Before you take the plunge you can read about Dr. Warren's philosophy behind the site, as well as numerous genuine success stories. 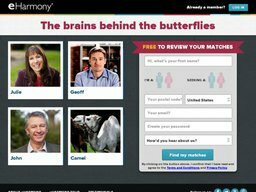 Data suggests that eHarmony accounts for 4% of US marriages! eHarmony pricing varies depending on your commitment. For example a single month to month commitment costs $59.95, but if you commit to paying for two years upfront this works out at just $9.95 per month. A 6 month commitment is $39.95 per month, and a one year commitment is $18.95 per month. You can get acquainted to the site first by using a free trial. You can aso get discounts on your eHarmony membership by applying special eHarmony coupon codes during the subscription process. At Coupofy we update our list as soon as new discounts become available so you are sure to find one you can use. eHarmony accepts all major credit and debit cards from your region of the world, including Visa and MasterCard. You can also pay with Paypal. There are plenty of different codes that can provide you with special deals, such as eHarmony renewal coupons. After you've found a special deal that you want, you simply need to enter your promotional code in the appropriate box on the payment page. The process of signing up and matching is fairly simple. You complete a relationship based questionnaire that aims to assess your personality beyond superficial things like hobbies. You are then automatically assigned potential matches that meet your personality profile. It is up to you whether you initiate contact with them or not. You can see a sample of these matches before signing up, and then you are free to contact them after choosing one of the subscription options. You can simply chat with your matches online and then progress to real life dates in your own time. You can restrict matches to your geographic area to make dating more practical. Cancellations can be made at any time from your online account. If you want a full refund you must cancel your account with 14 days of the first payment. This is in line with a credit card's "cooling off period" in the UK.